Earlier this week, we celebrated President Trump’s rollback of President Obama’s reckless environmental overreaches, but it would appear that we popped the champagne too soon. Colorado’s U.S. Senator Michael Bennet was waiting in the wings to rain on our parade with his bill (largely ceremonial) to block Trump’s “anti-climate” executive order. And it’s not just that Bennet has signed on, but according to his press release, he’s “leading” the effort. The only place that this rollback creates jobs is in Washington, D.C. At the EPA. For the rest of the country, this rollback will unleash energy development, which is a good thing for jobs and a good thing for American energy independence. Here in Colorado energy jobs are high paying jobs with plenty of career advancement. 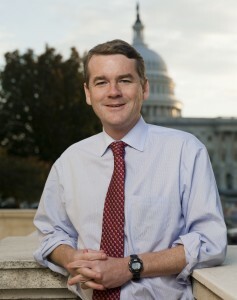 Sen. Bennet’s take only bolsters jobs for bureaucrats in Washington, D.C. If he visited Colorado more often, he’d know this executive order is a great thing for his constituents. Maybe Sen. Bennet should stop pandering to D.C. elites and radical environmentalists and start fighting for his constituents.